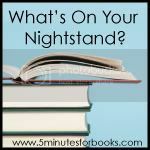 It’s the fourth Tuesday of the month which means it’s time for the October edition of “What’s on Your Nightstand?” at 5 Minutes for Books. My nightstand stack has gotten a bit shorter this month because I’ve focused on reading what was there before moving on to the rest of my Fall Into Reading challenge books. Once again, I planned on posting a picture, even took one and uploaded it, but for some reason WordPress isn’t let me add it to the post; maybe next month. The Englisher by Beverly Lewis. I’ve read several of her books in the past including The Preacher’s Daughter which is the previous book in this series, Annie’s People. The tales of Amish life and love that she tells are always enjoyable. Snow Flower and the Secret Fan by Lisa See. This one’s been on my “want to read” list for a while, so I’m looking forward to diving into it. I don’t feel like I read much in the last month, but I managed to finish three books. My Beautiful Idol – this book was great! It is a memoir telling the story of one man’s (Pete Gall) journey with and toward God. It’s entertaining, well written, and quite convicting. I would definitely recommend this book. A Wind in the Door – I finished the second installment in L’Engle’s Time Quintet and really liked it. I thought it was just as good as A Wrinkle in Time, and I’m looking forward to reading the third book in the series sometime in the future (probably this winter). The Center of Everything – This was a fun coming of age book without being cheesy or “chick-lit”-y (um, yeah, had to make up a word there). It addressed a wide variety of topics facing the narrator between the ages of 10 and 15 as it explored growing up in small town USA as a less-than-privileged child. Look into this one for a well written, engrossing read. I think that covers it for October. Check out “What’s on Your Nightstand?” to see what others around the blogosphere are reading this month. This Mommy gig? It’s not too bad most of the time. 1. The sound of crunching acorns underfoot and the fact that it always makes Little giggle. 2. Baking yummy things with apples; especially our favorite apple cake. 3. The smell of wood fires on the air. 4. Wrapping up in my favorite quilt and snuggling in on the couch to read after the kids are in bed. 5. The feeling of crisp, cool air on my skin after months of heat and humidity. 7. A return to playing in the cove in the mornings and afternoons without fear of heatstroke. 8. Drinking hot beverages (coffee, chai, cocoa) any time of day. 9. Wearing jeans while maintaining a comfortable body temperature. 10. The approach and anticipation of Thanksgiving and Christmas, my favorite holidays. And the one thing I hate? Having to wear real shoes instead of sandals or flip-flops (and the disappearance of sweet baby feet into socks and shoes). I confess, I hate cleaning our shower. I don’t just dislike it, I hate it. But, you say, hate is a very strong word. Yes, and I hate it. Let’s just say that it had been a while since any serious cleaning had taken place in the shower in our master bathroom. Don’t misunderstand, the bathroom itself is cleaned very regularly, just not the shower. When I saw at 5 Minutes for Mom that CLR was offering the opportunity to try their kitchen and bathroom cleaner as part of Tackle it Tuesday I jumped at the chance and hoped that this would provide the motivation I needed to get the job done. And it did. I had high hopes for the CLR cleaner. I tried not to expect too much, because, really, anything short of a product that would redo grout – or better yet, redo tile – wouldn’t live up to my expectations. I did, however, expect the product to cut the soap scum, clean off the mineral deposits, and, hopefully, make a dent in the mildew that I’d let build up on the grout and around the bottles (shampoo, face cleaner, etc) on the shower floor. I wasn’t disappointed. I followed the directions – spray on, leave to work for a few minutes, wipe down, let sit for 2-3 minutes, rinse with clear water – and the soap scum and mineral deposits wiped off and washed away with very little effort. The mildew on the tile itself cleaned off fairly easily with the scrubber side of the sponge. The mildew in the grout was a tougher kill (as I expected), but this cleaner cleared away some of the mildew stains completely and lightened or partially cleared most of the others. I also might have been able to get more of the mildew stains taken care of if I had put more elbow grease into it; I will probably work on them some more sometime in the coming weeks. Overall I was pleased with the results. I would recommend using the product in a well ventilated area (as directed) due to the fumes; I opened the bathroom window and this seemed to provide reasonable ventilation. (I generally use non-toxic cleaners (with the exception of bleach cleaners on toilets and in the tub), so I found the chemical smell to be quite strong and offensive.) I don’t think I would use the CLR Bathroom & Kitchen Cleaner as an all-purpose cleaner for these spaces, but I will definitely use it again in the shower. Most importantly, my shower is clean and I feel a sense of accomplishment because I finally made myself tackle it. If you find a product that will do my tile and grout work for me, please let me know. We’ve spent the last few months, and especially the last few weeks, trying to prepare Little for all of the new things she would experience on vacation. We covered the airplane – pointing out planes in the sky, talking about how we would go way up high, really talking it up. We covered the beach – talking about the sand, the big water, all the fun things we would do. We covered our living arrangements – talking about the condo, who all would be there, where we would sleep. I thought we had covered everything. I was wrong. I failed to consider the shuttle bus. We parked our car in an off-site covered parking lot, so we had to ride a shuttle from the lot to the airport. The bus pulled up behind our car while we were unloading the luggage, and Little stopped dead in her tracks. She stood perfectly still clutching dee and asking to be held while we got the bags and carseats from the car into the shuttle. When it was time to board the bus she flatly refused. Matt carried her on and sat her in his lap. We were successful in keeping her on the bus until we reached the airport at which point she gladly disembarked. Barb posted this meme earlier this week; it looked like a challenge, so I thought I’d try it. It’s based on the Scattergories game, and, let me tell ya, some of the questions were pretty difficult. ~Use the 1st letter of your name to answer each of the following questions. ~They have to be real places, names, things; nothing made up! ~You can’t use your name for the boy/girl name question. ~Tag 5 people to play along. 13. Something you shout: Jackpot! My tiny man isn’t so tiny anymore. This week marks the end of his sixth month in this world, and he is doing his best to make his mark on it. Today we went for his six month checkup and the doc said he looks great. He’s in 50th percentile for height, weight, and head circumference. He’s meeting or exceeding all of his physical and social milestones. And we seem to have his reflux under control. At weigh-in he tipped the scales at 17 pounds 11 ounces; up 3 pounds 9 ounces since his four month visit! He also measured a healthy 26 inches long. They were impressed with how well he’s sitting; he’s gotten very good at it in the last week or so. He’s been officially cleared to eat solids. We’ve been giving him fruits for the last few weeks, but now he can do foods twice a day and we’ll probably start adding Gerber puffs or something of that nature in the next couple of weeks. He is also allowed to drink some water now, so we’ll see how he likes the sippy cup. I love this stage – the constant learning and discovery and the emergence of his personality; he’s such a sweet and friendly baby. Just wish my little people didn’t have to grow up so fast. You are currently browsing the Sidetrack'd weblog archives for October 2008.